The second tenet of the seven principles of Leave No Trace is: travel and camp on durable surfaces. While on the Pacific Crest Trail, it may seem obvious that traveling on a durable surface means staying on the trail and for the most part that would be true. But, regardless of how much time someone may spend on the trail they are often confronted with situations where they need to leave the two-foot-wide trail tread. We’ve all seen makeshift trails around a blown-down tree or sections of trail that have become braided through a meadow. Whenever possible it is best to stay on the trails that seem to be getting the most use. The PCTA and our agency partners strive to repair braided sections of trail and ensure that downed trees are removed in a timely manner. But the nature of a 2,650-mile-long trail is that there are sometime situations that may persist until repairs can be made. 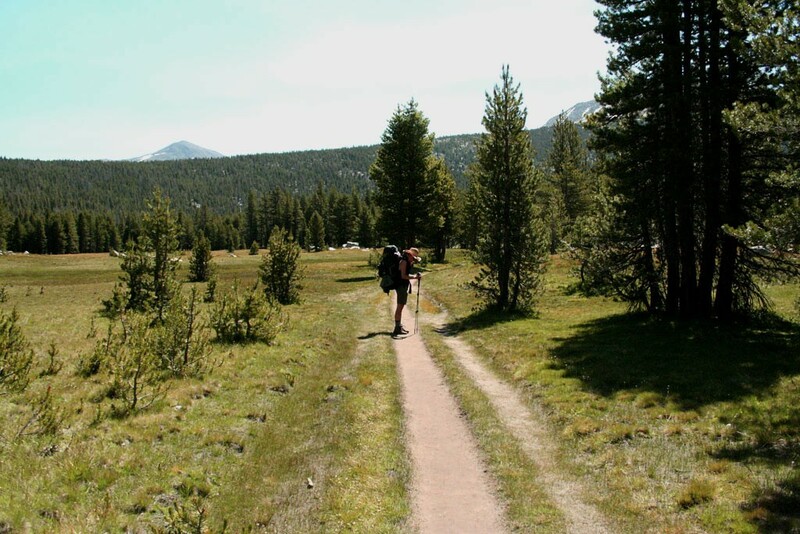 In the case of a braided trail, please walk in single file while staying on the most used path rather than contributing to further damage by walking through the meadow. And in the case of blow-down detours, there is often an obvious path made by others around the obstruction that everyone should stick to. A braided section of the John Muir and Pacific Crest Trail in Yosemite National Park. Please stay on trail, even if that means your feet get wet. Photo by Carl Alviani on Flickr. Perhaps even more common are the situations when PCT users need to leave the trail to find a camp or a private place to relieve yourself [see poop story #1, #2, #3]. Be mindful of where you step. Rather than walk through a sensitive meadow filled with flowers, wait until you have an opportunity to leave the trail on rock, gravel, or other dry soils. The same can be said for choosing a campsite. Good campsites are found, not made. Whenever possible, use existing campsites. Durable surfaces for campsites include rock, gravel, and dry grasses. It is also important to protect riparian areas by camping at least 200 feet from lakes and streams. And when traveling to and from the water source, stay on existing trails or choose your path carefully to take advantage of walking on rocks, gravel, and other dry areas. Traveling and camping on durable surfaces is important to protect the landscape that the PCT passes through so that those who come after you find it in the same condition. Doing your best to limit your visible impact on the land indirectly encourages others to do the same.